As war and economic crises engulf nations around the world, migrants flee in search of a better life. But when they arrive at the Port of Calais, northern France, they find camps as hopeless as the countries they came from. By a road near the Sudanese camp a doctor from Darfur watched the lorries pass, hoping that one would stop long enough for him to clamber underneath. Then he would try to cling on suspended just above the ground. There were more than 30 men eyeing vehicles nearby, all with a similar determination: to reach Britain however risky the means. There are still people traffickers here but most of the migrants we spoke to were destitute and could not afford to pay their fees. All day and night they play a game of cat and mouse with the police, hiding on board lorries or close to the roadside. But often they are discovered and dispersed with pepper spray. With new security measures it is becoming increasingly difficult to steal into Calais port itself, so the lorry parks and petrol stations are the new jumping off points for migrants. Each new world conflict throws desperate refugees in the direction of Europe and, specifically, towards Calais. The Darfur doctor would not give me his name but he was anxious to tell his story. "I can do nothing in my own country anymore. Nothing. The government does not want me. I want to go somewhere where I can be of help to people. "That place is England. I am sure I will be welcomed." Who had told him that, I asked? "Everybody says it," he replied. Such is the mindset among those fleeing Darfur, Afghanistan, Syria, Iraq, Eritrea and other zones of conflict or poverty. The UK has been mythologised; they are convinced jobs, good housing, education are waiting. There are now more than 1,000 migrants waiting in Calais and hoping to make the short crossing to the UK. Most live in squalid camps, collectively referred to as the Jungle. The most striking development since I last visited Calais nearly a year ago is the growing number of young women. Many come from Eritrea on the Horn of Africa, a country suffering under despotic dictatorship where mass conscription and forced labour blight the lives of the young. According to recent reports from human rights groups, as many as 3,000 people a month may be fleeing Eritrea. Among them was 17-year-old Aida whose journey took her across her own country's border to Sudan, from there to Turkey and then by boat to Greece. From Greece she made her way to Calais, either on foot or by hitching lifts. Aida arrived in Calais a week ago and looked exhausted when we met. Her home was a tiny tent shared with another young woman. "My plan is to learn…to go to England," she said. The journey and life in the Jungle are full of perils for young women. She described her fear of men: "They offer to help but they always want something." In Aida's case there was small piece of good luck. While we were in Calais she was offered shelter in a women's refuge. Among other "luxuries" it meant she could now take showers. "It is so nice. I am clean!" she told me with a beaming smile. For most however there is no refuge and no prospect of getting to the UK - at least not any time soon. On both sides of the channel there appears to be a growing determination to end the illegal cross border traffic. French police are now far more conspicuous in their patrolling and the UK has offered £12 million to help the authorities in Calais prevent migrants breaching security. For many locals in Calais there is growing desperation at the growth of squalid camps around their town. And while there are local charities attempting to help the migrants with food, clothing and tents there is a groundswell of opinion demanding action to curb the growth of the camps. "Of course I have sympathy with them as human beings," said local police union spokesman Gilles Debove. "But the police are now facing aggression... The police also have to protect the economy in this area." 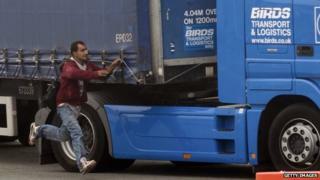 Stopping migrants getting onto lorries at Calais could lead them to flock to other ports along the coast facing the UK. Already there are reports of traffickers offering to smuggle people from Dunkirk. Others are trying to reach Britain from Belgian ports. The roots of this crisis lie in the tragedies engulfing nations in the Middle East, Africa and South Asia - wars, tyrannies, economic crises in which there is little chance of change. The UN Security Council is utterly divided and the prospects for negotiated outcomes or concerted pressure on tyrants have rarely been as remote. There is no world order to keep a peace or protect the rights of the vulnerable. Against this background the refugees will keep sailing and trekking westward while European governments struggle to answer public concern over migration and the demands of common humanity.